How to quickly see whether MSE is updating definition files (to capture the latest threats) and protecting your home computer. Microsoft Security Essentials is the 2nd most popular anti virus program in the world in 2013. Are you considering using this program? If so it is worth your while to take a look at Part 1, the Microsoft Free Anti Virus tutorial. I use Microsoft Security Essentials on all of my home computers. Microsoft tend to get a rough press in the IT Industry. However, in my opinion, this Free Computer Virus Scan software is one of the better ones out there. 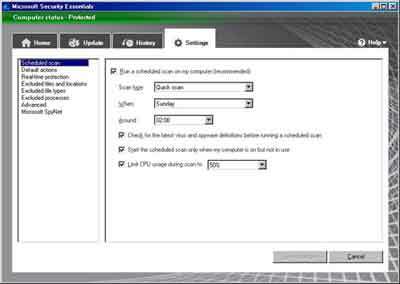 How do you have Microsoft Security Essentials setup? Does it differ from my recommendations below? Explain why you think your setup is right and mine is wrong! Make your own personal web page by simply completing the Microsoft Security Essentials Setup Form at the bottom of this page. You can also read about Other Visitors Recommendations at the bottom of this page. If you decided to tick the Scan My Computer For Potential Threats After Getting The Latest Updates box at the end of the installation process, the Microsoft Security Essentials program does exactly that! The first thing you see is the screen below. Make sure you have an Internet connection for the latest updates to be applied. If you take a look at your MSE system tray icon, you will see a 'green arrow' running down the 'blue castle'. This is your confirmation that the definition update process is running. Once the virus removal definition files are updated a Quick Scan of your computer is performed. Hopefully your machine is clear of any threats. However, what do you do if suspicious programs are detected on your computer? Go to the Microsoft Security Essentials tutorial to find the answers. It is worth noting that you don't have to wait for Windows Updates every week to receive the latest definition files. You can click the Update button at any time. The Microsoft Virus protection settings section is where I can share my knowledge and experience of Microsoft Security Essentials with you. There are a few amendments I make to my setup at home. So lets go through each option in turn, starting with the Scheduled Scan. A Scheduled Scan should always be enabled! I leave the Scan Type on Quick Scan because I am using my computer a lot of the time and I want to minimise the impact on performance whilst I am working. You have the flexibility to schedule a scan to suit your own circumstances. Take the time to think about this, then schedule accordingly. For example, if you leave your computer on 24/7, you could select a Full Scan to run Daily in the small hours of the morning. You could also untick the Limit CPU Usage During Scan option if you are not using your computer when the scheduled scan begins, enabling the scan to complete quicker. I tend to leave all options ticked. Default Actions is where you can decide what happens when Microsoft Security Essentials detects potential threats. Microsoft Virus protection classifies each threat by level of severity, depending on the level of damage they can cause you. A Severe Alert Level is for Malware and Viruses that can cause serious damage to your computer, stealing information and preventing your device from working properly. I have this alert level set to Remove the offending threat when detected. I recommend you apply the same setting. You need to remove computer virus threats with this threat level ASAP! You can change any alert level by clicking the drop-down arrow and selecting your option from the list presented. I also recommend the High Alert Level be set to Remove. Threats classified as high can be just as disruptive as threats rated severe! I personally have Medium and Low Alert Level threats set to Recommend. This means you benefit from Microsoft Security Essentials recommended actions, but ultimately decide on the course of action. Sometimes threats with these alert levels are genuine software on your computer that is misinterpreted as a virus or other form of malware. If you have a Medium or Low alert, check to confirm whether you recognise the software in question. If it is something you have intentionally installed, or you know is installed on your computer, choose the Allow option. If you do not recognise the software, do a little research on line first. Choose the Remove option if you cannot determine what the program is e.g. a genuine Operating System program. I also leave the Apply Recommended Actions option ticked. Real-Time Protection should be left with the default settings. Ensure all the boxes are ticked. Real-time protection is a live computer virus scan that checks activity on your PC as it happens. This way potential threats are dealt with so they do not become problems. There are lots of sites that host downloadable files that look legitimate, but are actually Malware or Viruses, or programs that contain hidden nasties that install without your knowledge. This is why you need the Scan All Downloads option ticked. I also recommend the Monitor File And Program Activity On Your Computer is set to Monitor All Files. Enable Behavior Monitoring and Enable Network Inspection System are two additional security protection settings. The intelligence built into real-time protection enables Microsoft Security Essentials to identify virus and malware 'patterns'. Any suspect files that look like malware is flagged. The latest version of MSE only gives you the Turn on real-time protection (recommended) option. My assumption is that the importance of having all the other options enabled means that you do not get the choice to disable them anymore. This is a good thing. Viruses and Malware can't execute in a text file. Cyber Criminals tend not to use these types of files. Professional IT Companies exclude text files (*.txt) from the scanning process to speed things up. I prefer all files and file types to be scanned. Better safe than sorry. However, if you wanted to exclude a certain file type, enter *.txt or alternative into the File Extensions field then click the Add button. I have the same stance with Excluded Processes. Exclude none! I'll be patient and wait for the scan to complete. Processes are what happens when you double click on an icon to load a program. There are also lots of other processes that run instructions to do things like make your Operating System work. Suffice to say they are necessary to the workings of your home computer system. I tend to use all of the Advanced settings except the Remove Quarantined Files After: option. This is simply because my Default Actions settings do not include quarantined threats. I prefer to Scan Archive Files in case any nasties have made their way into my compressed files. This is a little belt and braces but I think you can't take chances! I Scan Removable Drives for precisely the same reason, and I prefer to create a System Restore Point in the event a problem occurs and I need to return the system files back a working state. I also Allow All Users To View The Full History Results. I have nothing to hide! The final settings option is whether you want to join the Microsoft Spynet - "an online community that helps you choose how you respond to potential threats". I choose not to join. However, If you would like assistance from the online community then there are Basic and Advanced membership options to choose from. Couple of final thing to mention. You can open Microsoft Security Essentials by right clicking the System Tray and selecting Open from the menu. You can also view the History of detected items on your computer. The Alert Level and Action Taken are just some of the details you can see in this window. I hope the discussion helps you to make the right choices for setting up Microsoft Security Essentials. 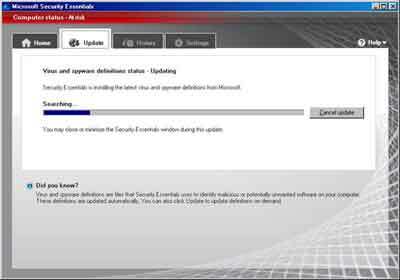 For more information on Microsoft Security Essentials virus removal take a look at Techradar (Opens New Window). If you haven't read it already take a look at part 1 of this tutorial series Microsoft Free Anti Virus. 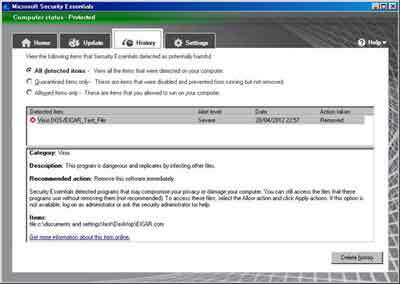 How do you have Microsoft Security Essentials setup? Does it differ from my recommendations? Explain why you think your setup is right and mine is wrong! Enter Your Title e.g. "Medium Alert Level Set To Remove"
Your Setup will appear on a Web page exactly the way you enter it here. You can wrap a word in square brackets to make it appear bold. For example [my story] would show as my story on the Web page containing your story.